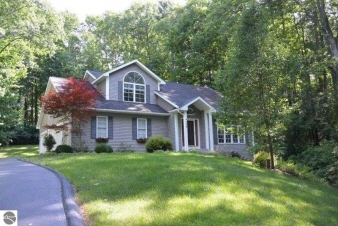 Description: Private wooded seclusion in a high-end neighborhood. Elegant, nicely flowing home w/ fresh paint, neutral colors (family rm is exception, red), truly turn-key. Living rm w/ extra-large windows & new carpet. Hardwood floors on main level all freshly refinished. Amazing remodeled master bd, new bamboo flooring (also in closet & hallway), huge walk-in closet. Master bath has custom porcelain tile, granite counter, custom tile shower over tub, heated floor. Recently finished ll w/ fam rm, ll bd, private bath w/ ceramic tile shower, granite counter, heated floor. Oversized 3-car garage. Waterfront parks & beaches, tart & vasa trls, mt. Holiday skiing close by.